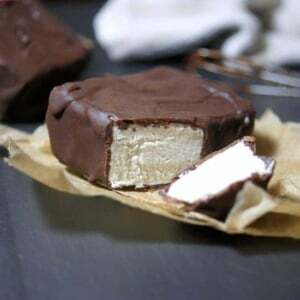 A dairy-free version of the popular chocolate-covered ice cream bars! Line a standard loaf pan with parchment paper and set aside, then drain and rinse the cashews, discarding the soak water. Combine the soaked cashews, water, coconut oil, honey, maple syrup, and vanilla extract in a high-speed blender, and blend until completely smooth. Adjust the flavor to taste, if necessary, then pour the ice cream batter into the lined loaf pan. Place the pan in the freezer until the ice cream is frozen solid, about 4 to 6 hours. Remove the pan from the freezer, and grab the parchment paper to easily remove the solid slab of ice cream. Use a sharp knife to cut the ice cream into 8 square bars, then return the bars to the freezer until the chocolate coating is ready. Prepare the chocolate coating by whisking together the melted coconut oil, cocoa powder and maple syrup. (Using a whisk helps break up any clumps!) Feel free to taste the mixture and adjust the ingredients to taste-- add more cocoa powder for a darker chocolate, or more maple syrup for a sweeter chocolate. Spoon the chocolate coating over each ice cream bar, being sure to coat all sides evenly. (This part can get messy!) Place the chocolate coated bars on a plate lined with parchment paper, and place the finished bars in a sealed container in the freezer until ready to serve. Enjoy!